People often compare cannabis and alcohol, putting them head to head. But some people are beginning to mix the two together… Yes that’s right, cannabis infused alcoholic beverages. That you can order at a bar. Take for example West Hollywood’s Gracias Madre, a vegan Mexican place where Jason Eisner is creating CBD infused cocktails that are becoming quite popular. Since CBD is the compound in cannabis that helps to reduce pain and can give you energy, these drinks make a great starter. Eisner has three different cannabis drinks, the Rolled Fashioned, the Sour T-iesle, and the Stoney Negroni. He started making the drinks in order to treat injuries that he sustained playing sports. While the price of the drinks are surely high, they will have you feeling great on a night out. CBD oil, which is what is used in the drinks, has a slight earthy taste to it as well, which will give the drinks an interesting taste. For those that aren’t near West Hollywood or in a legal state, you can make a drink that may just simply remind you of cannabis. The Liquid Marijuana is a delicious beverage that you can make as a shot or a drink. It’s fruity and smooth, so be careful not to drink too many. Try one out the next time you go to the bar or grab a few nips and make your own at home. The liquid marijuana makes a really good unwind drink, something that will be good to kick back and relax with at the end of the day. Take a pint glass and fill it with ice. Pour in 1/2 oz Captain Morgan spiced rum. 1/2 Malibu coconut rum, 1/2 oz Midori. Pour in some pineapple juice, leaving a space at the top of the glass for a splash of sweet and sour mix. Shake everything together vigorously and there you have it, a liquid marijuana drink. It was only a matter of time before people began to mix cannabis and alcohol to form new kinds of cocktails. 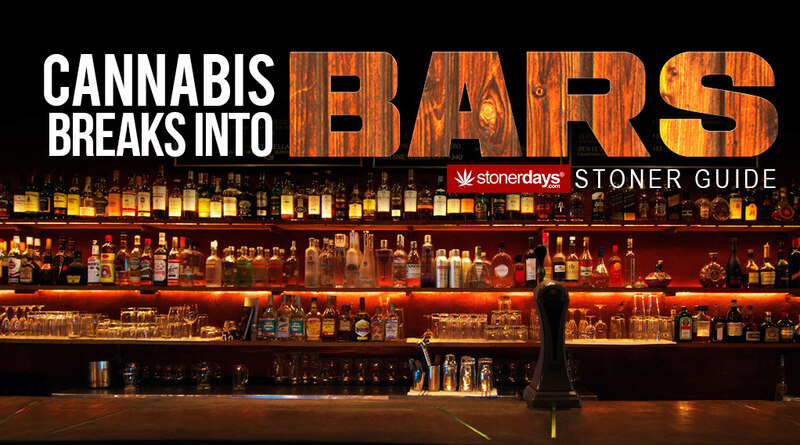 Pot bars will definitely be a thing of the future, with bartenders specializing in cannabis infused cocktails for all different kinds of people. Some will be stronger in THC, some in CBD. It is only a matter of time before we see these interesting new establishments appear. Please remember to smoke and drink responsibly. This entry was posted in Featured, Stoner Guide and tagged bars, cannabis. Does Marijuana Give You Anxiety?